The Bloodhound (sometimes called a 'St. Hubert Hound' or 'Flemish Hound') is a very old breed which was perfected in Belgium. It was bred specifically to track humans, and is world renowned for its tracking capabilities. One common misperception is that Bloodhounds are so named due to their taste for blood. In fact, Bloodhounds are extremely nonviolent; the name is derived from the very high degree of breeding that went into their creation. Bloodhounds combine an amazing sense of smell with powerful instincts. The Bloodhound’s tracking abilities were famously shown in the film 'Cool Hand Luke'. A famous Bloodhound named Nick Carter tracked down over 650 criminals. The Bloodhound has a shoulder height of 58-69 cm (22.75-27.25 in) and weighs 36-50 kg (80-110 lbs). It is very large and strong, with a long muzzle, droopy ears, and loose hanging skin. The Bloodhound has a muscular neck and back, giving it strength and endurance. It has a curved tail and deep, lively eyes. The Bloodhound has an ideal physiology for tracking, combining large nasal chambers, long ears that block wind while the Bloodhound is sniffing the ground, and folded flesh (the 'shawl') which catches and holds stray scent particles. The Bloodhound has a very short, hard, smooth coat which covers the whole body. It is composed of fur only, with no outstanding hairs. Bloodhounds come in red, black and red, or liver and red. A white Bloodhound called a 'Talbot Hound' existed in the Middle Ages. The Bloodhound is mellow, independent, gentle, kind, and affectionate. It is mostly silent, but loud when it barks. Bloodhounds make great companions, even when you aren’t hunting down escaped convicts. The Bloodhound is mellow, independent, gentle, kind, and affectionate. It is mostly silent, but loud when it barks. Bloodhounds make great companions, even when you aren’t hunting down escaped convicts. The Bloodhound loves children as long as they don’t pester the dog unfairly; pulling of the ears should not be allowed. Bloodhounds will greet visitors happily and live in harmony with other dogs and household pets. Bloodhounds are attentive but not aggressive with strangers. They are relaxed and affectionate at home, but become alert and tireless when on the trail. You can find Bloodhound puppies priced from $250 USD to $1600 USD with one of our credible breeders. Browse through our breeder's listings and find your perfect puppy at the perfect price. The Bloodhound loves children as long as they don’t pester the dog unfairly; pulling of the ears should not be allowed. Bloodhounds will greet visitors happily and live in harmony with other dogs and household pets. Bloodhounds are attentive but not aggressive with strangers. They are relaxed and affectionate at home, but become alert and tireless when on the trail. The Bloodhound requires occasional brushing. Cleaning the Bloodhound's ears periodically to avoid ear infection is recommended. The folded skin should be wiped down regularly as well. Bathe only when necessary. The Bloodhound eats generously, so avoid overfeeding and provide regular exercise to keep it in shape (but do not over exercise a young pup). If possible, spread meals out and avoiding exercise immediately after eating. The Bloodhound lives 10-12 years and has litters of 8-10 pups. The Bloodhound requires consistent training as it is quite stubborn, though it is eager to please its master. A great deal of patience and tact is required when training Bloodhounds. It is very sensitive to the tone of voice, so a firm but approving tone is best. The Bloodhound may be difficult to housebreak. Bloodhounds are often portrayed as lazy, but this isn’t the case. 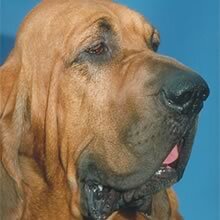 Bloodhounds require regular exercise and can walk for hours on end. Consider taking them hunting and be prepared to do a fair amount of hiking on a regular basis. Bloodhound Puppies for Sale - Shipped Worldwide! Finding the right Bloodhound puppy can be dog gone hard work. PuppyFind® provides a convenient and efficient means of selecting and purchasing the perfect Bloodhound puppy (or Bloodhound puppies) from the comfort of your home, 24 hours a day, 7 days a week. Take advantage of our PuppySearch or leisurely browse our directory of hundreds of dog breeds, Bloodhound dog breeders, Bloodhound dogs for adoption, and Bloodhound puppy for sale listings with photos and detailed descriptions. Some Bloodhound puppies for sale may be shipped Worldwide and include crate and veterinarian checkup. Many Bloodhound dog breeders with puppies for sale also offer a health guarantee. With thousands of Bloodhound puppies for sale and hundreds of Bloodhound dog breeders, you're sure to find the perfect Bloodhound puppy.